Building a startup is tough, from generating an idea, developing an MVP, launching a product, and eventually growing a business. It’s just really hard. But what if I told you it’s entirely possible to launch a startup in 25 days, from zero to Apple iTunes store. I still wondered how Jason Ho, my CEO and Bobby Liu, our client and the founder of Topica Founder Institute, had ever thought it would be possible to launch a new app in just 25 days. By the way, It took us two days to deliver the prototype to Bobby. Jason had an offer from his friend Bobby, to create an app for a quote that eventually called Quotebl. After major low fidelity hacking. Somehow, we made it work. We didn’t know how we’d do it at the time, but we tried and tried, and figured it out. I have to admit, when Jason brought me the whole idea to build it within 25 days, I was not quite sure if we could make it. We’ve already had so many other on-going projects at that time. Sometimes, an entrepreneur’s job is not to know all the answers; it’s to figure them out. Two days later, the prototype was sent it to Bobby, which meant that we, D8ii limited successfully launched the app within 25 days. That initial challenge has given way to a new one: to scale and grow this into something real. We’re going to share that journey with you . We used trello to identify any bugs and features we wanted to add between developer and me. If you use Trello you know this. Trello is tricky. Although it makes our lives well-organized and more productive, we tend to jot down the way we understand thing without considering other people. We had to communication with clarity. So we talked and wrote in a crystal clear way instead of being clever. We wanted to understand each other without having to ask in person. Because it means to interrupt ones workload. Over-communication is often looked down because it reduces productivity. People prefers to communicate in smart way. People wants to work cleverly. We over-communicated repeated things more times than we would intuitively. We were consist of multicultural team; Vietnamese developer, Japanese marketer (me), British CEO, and Thai client. We had to communicate as clearly as we possibly could. It means we use more words to explain even if it feels obvious. We also avoid making assumptions (Believe me, assumptions are the enemy of startups). Instead, we ask the extra question to have the full picture. Most people never take the first step for fear of the unknown. Starting something new is terrifying. We always wonder many questions in our mind even before trying. If you are not like me, then lucky you! I had a practical lesson while working on the project. First of all, your life doesn’t have to depend on a startup venture. Especially, when you just started. In most cases, even if you had a complete failure, the outcome won’t be that bad. In our case, we managed to successfully launch the startup. So I pushed my fear of failure and imaginative risk away. This is something I learned from Jason. He always said most startups fail because they fear of being wrong before even building their services. It is easy to have great ideas, especially in today’s world. But way too many people don’t take action because they fear of being wrong is powerful. We made adjustments until we made an app that meets, exceed our client expectation. If you are still reading this, you know that Jason and Bobby only used a pen and a paper for its business plan. If you’re really serious about starting a business, a pen in your pocket and a tissue at the cafe table will turn your vision into a reality. That is precisely how it happened says Jason. The Quotebl is an awesome to make quotes easily. Behind the beautiful photos, the filters, and the fonts, Quotebl is providing interesting features for both marketers and non-marketers. This app does everything you could possibly want it to do and not only that, beautifully carefully designed and extremely intuitive to use. Bobby and Jason believe in the power of inspiration. 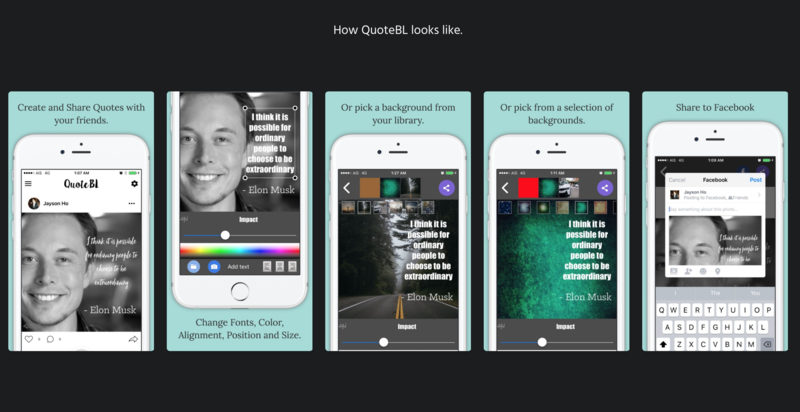 Quotebl will improve your inspiration in every creative way. 4 lessons I learned from launching a #startup in 3 weeks. Who says lean startup doesn’t work? Quotebl 25-days launch may be extreme. However, the same principles the startup used can help your company move faster and more effectively. Nice article and its worth to read!! !